The tax burden on Alabama's lower-middle class is among the worst in the nation. For a family of four living near the poverty line, Alabama ranks as the worst of all 50 states for highest income tax in the nation. Whereas the Alabama family pays upwards of $500 at the poverty line, citizens of other states with the exact same income pay nothing, or obtain credits, according to the Center for Budget and Policy Priorities. 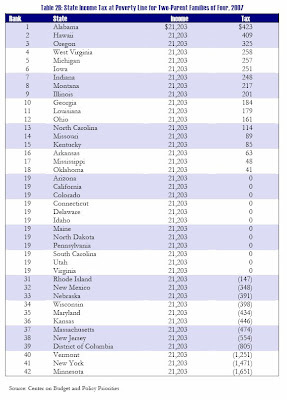 Alabama also has one of the largest disparities of income between families with high income and those with low income. The gap is growing between upper and lower incomes, as well. With sales taxes and consumption taxes added, the burden grows even larger on low to middle income families. View the report from the Center for Budget and Policy Priorities HERE.